After the worst December for stocks since the Great Depression, which saw the S&P500 tip into bear market territory if only for a few seconds on December 24, the market enjoyed a furious rebound last month, when it climbed 7.9%, the best January return since 1987, a fact that was not lost on president Trump who is back to tweeting about the market after taking a 3 month hiatus during the Q4 swoon. Of course, as extensively discussed here and elsewhere, this miraculous rebound was entirely due to the Fed's bizarre, according to some laughable dovish reversal, which has put rate hikes on hold at least until the summer if not indefinitely with the market now officially expecting the Fed to cut rates in early 2020 when the recession hits, paradoxically giving stocks a green light to keep levitating up until the point the US economy contracts if not beyond: after all at some point, the Fed will have to launch QE4, and that as every shoeshine boy knows, is bullish for stocks which long ago ceased to reflect the economy and merely rise and fall based on how much liquidity the Fed is injecting or draining from the market. 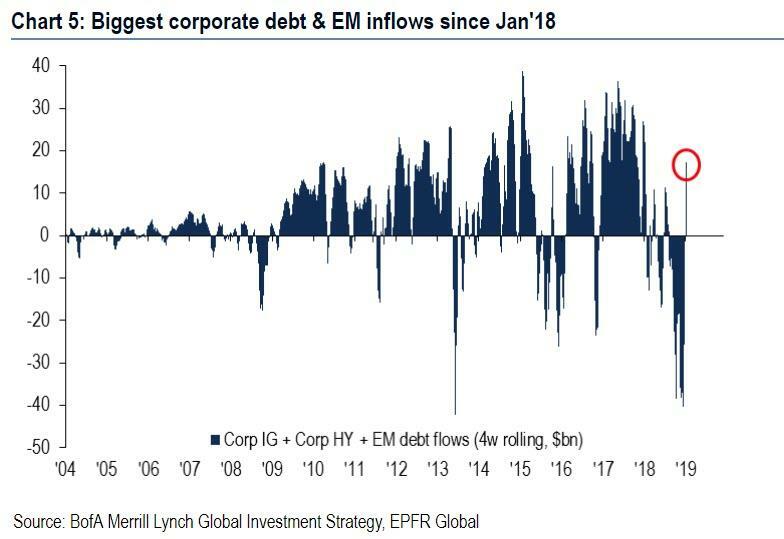 And yet, something strange happened: at a time when stocks continued to surge, investors were not buying it the market's latest miraculous recovery, and according to EPFR, this week saw wildly risk-off flows with $9.4 billion allocated to bonds while $15.0 billion was pulled out of equities. 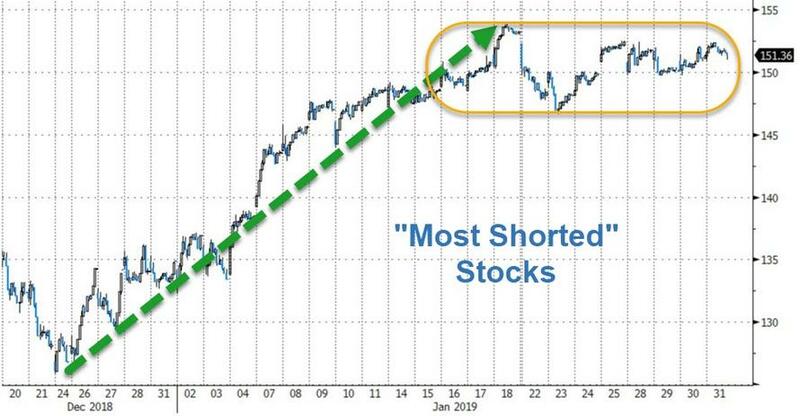 Which, once again, begs the question: was the recent rally just one giant short squeeze? 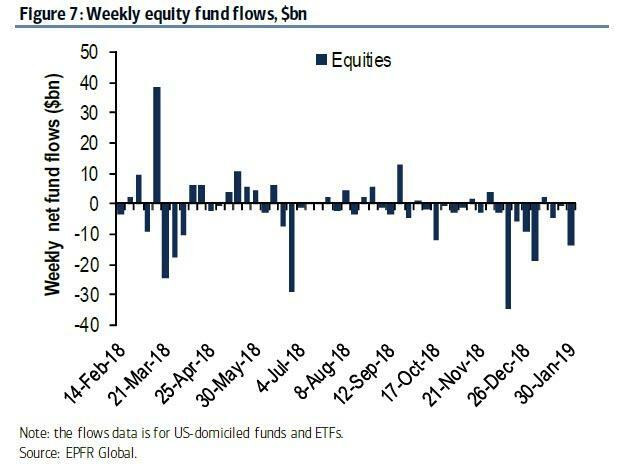 As Bank of America's Michael Hartnett points out in his latest Flow Show, not only were billions pulled out of US equity funds, with outflows on 10 of the past 11 weeks, culminating with $12.1BN in ETF outflows and $2.9BN in mutual funds outflows this week, but US equities have suffered record outflows in the past 3-months, amounting to $82.0BN, equivalent to a whopping 2% of all AUM, i.e. consistent with US equity bearishness at "events" & "big lows" of past decade. ... while IG bond funds saw $4.7 billion in inflows this week, the biggest since Feb'18. 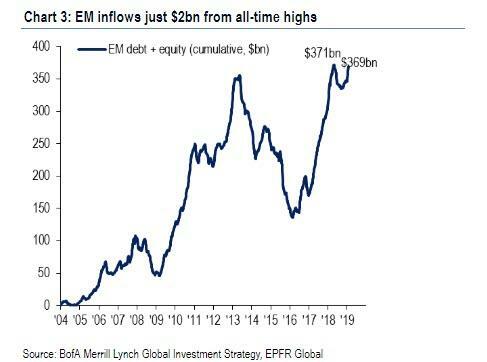 Meanwhile, betting on a sharply lower dollar, investors allocated even more funds to EM which saw another week of inflows, with BofA noting that the cumulative bond & equity inflows to EM are now back to just $2 billion from all-time highs. So what accounts for this odd divergence? 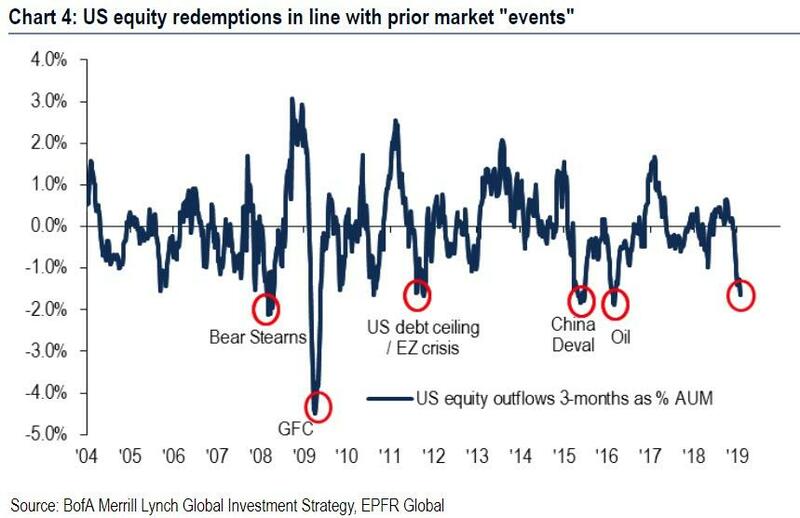 According to BofA it's all the Fed trade, i.e., "long risk, long leverage, short vol", as the fear of a credit event in Dec'18 caused the now infamous Fed capitulation on tightening... and it worked as credit ETFs, such as EMB/HYG/LQD, are all back at highs. And yet, not all is well just yet, because as Hartnett notes, the BofAML Global EPS Model still forecasts 0% 2019 vs consensus +5%, adding that the model says end of EPS recession will be signaled by steeper US 2s10s yield curve (>50bps), as well as a rebound in Asian export growth, easy China financial conditions, and rising global PMI - in short "watch Jan ISM & new orders tomorrow...must bounce." It bounced in the US... it dropped pretty much everywhere else. Hartnett concludes with what he dubs the "Most contrarian trade in world" which is now a Fed hike in 2019 - consensus now rushing back to "low growth, low rates" playbook of long credit, EM, growth stocks. As such, the greatest irony of all would be if the Fed ended tightening just as wage inflation is set to accelerate further. As such, the best hedge against inflation & complete collapse in Fed credibility is short US dollar, long small cap value stocks.